We’ve been talking a lot of the realities of rain – that we can’t count on it to fall when and where we need it – and that we need to plan for our water future. So what does ‘the plan’ look like? Our Water Security Program is our plan to provide South East Queensland with drinking water over the next 30 years. This includes planning for extreme weather — both flood and drought. Looking so far ahead means our plan has to be adaptive – balancing demand (how much water communities use), supply (how much water we can source, treat and transport) and the operation of our water grid (how we transfer water and what sources we use) so we can provide water for life. You can read a summary of the Water Security Program or check out the whole program. We’ll be releasing other region plans soon. We can’t always count on the rain to stop falling when we want it to. As North Queensland experienced record floods in February 2019, South East Queensland had just endured one of its driest January's on record. Floods are a part of the climate in South East Queensland, and just as we plan for droughts, we have plans in place for when there are floods, too. Find out more about flood mitigation by reading our fact sheet and checking out the video of how we operate two of our gated dams, Wivenhoe and Somerset. We all know South East Queensland’s climate can vary – from storms and floods, to droughts and heatwaves. The climate has already changed and will continue to change – and SEQ will experience more extreme weather as a result. This is just one of the factors we need to take into consideration when planning for South East Queensland’s water future. We’ve already had a taste of this when the dams on the Sunshine Coast – normally our most reliable – experienced an unprecedented two wet seasons in a row with well below average rainfall. Although our Water Grid supplemented water supplies on the coast to slow the drawdown on the local dams, and eventually replenishing rains arrived - it brought home that without a climate resilient source, like a desalination plan or water treatment plant that can recycle water, the Sunshine Coast is vulnerable to the effects of climate change. That’s why we’re planning to have a new water source on the Sunshine Coast in the next 15 to 20 years. Check out our Climate Change Fact Sheet and Infographic for more information, or leave your climate change question on our discussion forum. ‘I love a sunburnt country…a land of sweeping plains… of ragged mountain ranges… of droughts and flooding rains’ is a familiar refrain to many of us. South East Queensland has a climate of extremes – from storms and floods, to heatwaves and droughts. The reality is that another drought will happen in South East Queensland. While we are one region, dry conditions may persist in a part of our region – such as right now, in the Lockyer Valley, while others enjoy healthy dam levels – such as the Gold Coast. We may need to tailor our operational response to particular sub-regions, given the combinations of water sources they have and the ability of the SEQ Water Grid to move water to that sub-region. Our focus was drawn to the northern sub-region in 2017 after it experienced a second failed wet season in 2016-17, which was unusual. The two main major storages in the northern sub-region are Baroon Pocket Dam and North Pine Dam. From 2015, Baroon Pocket Dam and North Pine Dam were progressively drawn down as rainfall was insufficient to fully replenish them. The northern sub-region also relies on Ewen Maddock, Cooloolabin, Wappa and Lake Macdonald dams. Baroon Pocket Dam is a relatively small storage with a volume of 61,000ML (equivalent to only 5% of the Wivenhoe Dam storage volume). The catchment that contributes flows to Baroon Pocket Dam has been a reliable source, historically using about 60% of its capacity each year. The size and nature of Baroon Pocket Dam means that extended drought conditions can result in a decline of water levels and very limited time to implement contingency measures. North Pine Dam has a larger storage with a volume of 214,000ML compared to Baroon Pocket Dam (equivalent to 18% of the Wivenhoe Dam storage volume). A key consideration for water supply in the northern sub-region is the time required to implement contingency measures in the event of extended drought conditions. The southern sub-region can access the Gold Coast Desalination Plant, while the central sub-region can use the Western Corridor Recycled Water Scheme. The recent dry period has highlighted the vulnerability of the water storages in the northern sub-region to drought without appropriate water transfers from the central to the northern sub-region via the SEQ Water Grid. In 2017, the grid was used to transfer water to the Northern sub-region, supplementing the sub-regions local water supply. 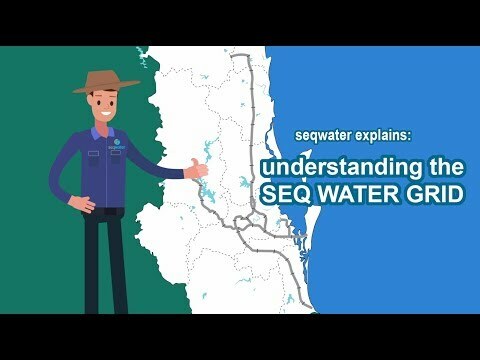 Seqwater continues to operate the grid in this manner. While the grid is able to provide water to this sub-region, its capacity is limited and cannot meet total demands without input from local water supplies.